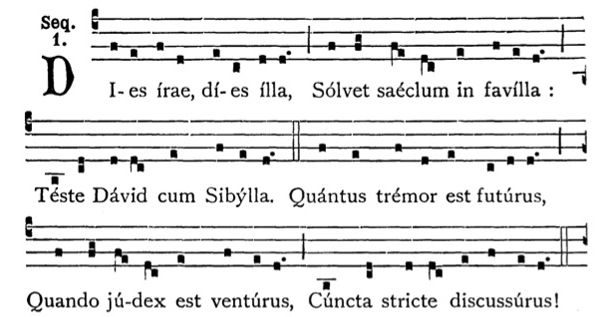 Dies Irae is the Gregorian chant Latin sequence sung at the Roman Catholic Requiem mass. It dates from at least the thirteenth century and is often attributed to Thomas of Celano of the Franciscan Order or the Dominican Latino Malabranca Orsini. In some sources its origin is ascribed to St. Gregory the Great, St. Bernard of Clairvaux, or St. Bonaventure. The text describes the day of judgment, the last trumpet summoning souls before the throne of God, where the saved will be delivered and the unsaved cast into eternal flames. Dies Irae is in the Dorian mode. See a list of other chant themes here. Posted in Themes. Tagged chant, Dies Irae, Dorian Mode, Gregorian Chant, Latin, Requiem.